As a witch, you undoubtedly have experience with a multitude of magical tools. You know the care and keeping of your tarot decks, the proper method to charge your crystals, and how to intuit using a pendulum. But the most powerful magical tool in your toolkit is often the most overlooked; it's your body, and it's the singular home of all pleasure, magic and self-love in your reality. 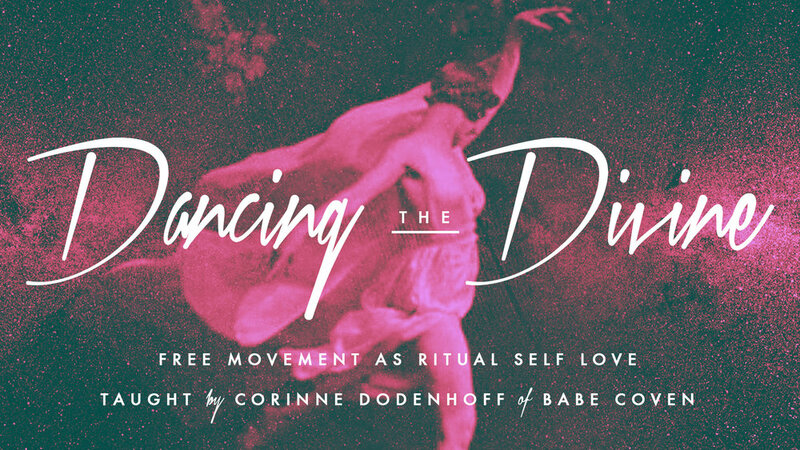 On April 29th, join Babe Coven co-founder, burlesque dancer, body positive activist and pink witch Corinne Dodenhoff as she teaches you about one of the most sacred and ancient practices for accessing this magical conduit - Sacred Dance and Free Movement. You'll learn about how to use these practices for abundant self love and creativity. In this class you'll experience the basics of Sacred Dance, and will walk away with the tools to craft your own free movement ritual. You'll explore ways to ground and connect to your body, helping you to experience a fuller and more sensuous life. Lastly, you'll discover how living and moving with intention has connections to the rest of your entire magical practice. Bring a yoga mat, pillow or blanket, and come dressed in something that is easy to move in and feels good on your skin. This class and space will be accessible to folks in wheelchairs or with walkers. Please note: This class is 18+, and only open to women, femme-identifying people, and GNB folks. No photography or videos allowed. Corinne Dodenhoff is a practicing pink witch, part-time model and body positive activist, and budding burlesque dancer from New Jersey. She forms one half of Babe Coven, a queer, witch-run brand and event production company. She has been featured in Slutist, NYLON, In the Shwick of It, Hello Giggles, and more. You can find her at www.corinnedodenhoff.com or at www.babecoven.com, or on Instagram at @misswhiskeyginger.